PARIS, July 15, 2010 (AFP) - Nicolas Anelka, the Chelsea striker at the eye of the storm that rocked the French team at the World Cup, described Thursday the tensions between the squad and coach as a timebomb waiting to go off. Anelka was sent home from the World Cup in disgrace for verbally abusing France coach Raymond Domenech at half-time in the 2-0 loss to Mexico in the group stages of the competition. 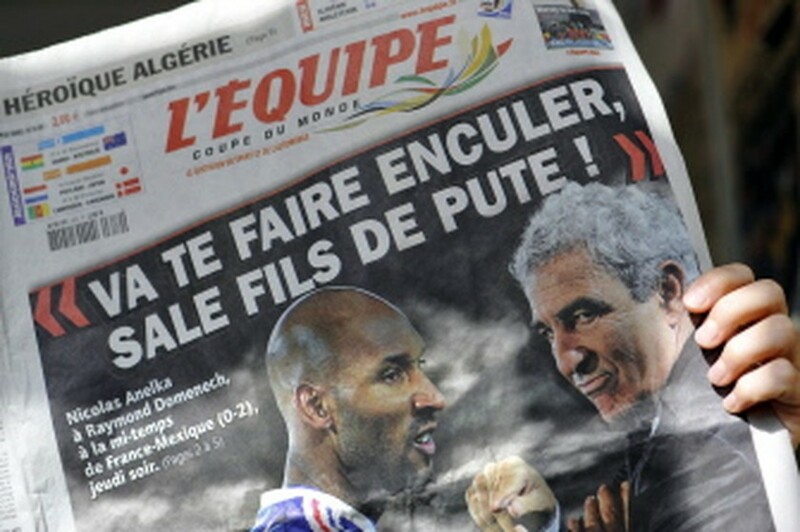 (AFP files) A picture taken on June 19, 2010 shows the front-page of French sport newspaper L'Equipe in Strasbourg. His expulsion provoked an angry reaction from his teammates who refused to take part in a training session ahead of their next game against South Africa which the French eventually lost, ending their World Cup campaign. "If it hadn't been me that brought everything to a head, it would have been someone else. It was a timebomb waiting to explode," Anelka told France-Soir newspaper in his first comments on the drama in South Africa. "Everyone, and I really mean everyone, was as one," he said of the camaraderie amongst the players. "If there were some players who wanted to train, let them speak now. But I'm 100 percent sure that nobody will want to." Anelka also rounded on former team-mate Bixente Lizarazu, now an outspoken television pundit and a virulent critic of Les Bleus in South Africa. "When you've been a player, you must have some respect. Lizarazu, who's he? He's just a ex-player lacking recognition who's reinvented himself as a torpedo act."